This 5 1/4" long sharpener can be used for almost anything. 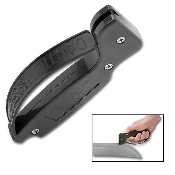 Can be used for sharpening kitchen knives, pocket/hunting kives, axes, and even arrow heads. Due to the unique design of the blades they can be reversed for double life.